New Castle County 4-H and the 4-H Food Smart Families program will hold the third annual Quest for the Clover 5K walk and run and a 4-H Fitness Fun Day on Saturday, Sept. 27, in Wilmington. The race check-in is at 9 a.m. and the race starts at 10 a.m. Through the involvement of the 4-H Food Smart Families program, this year will also feature a 4-H Fitness Fun Day after the race from 11 a.m.-3 p.m. Lunch will be served and each family will receive a bag of groceries. There will also be stations set up to allow participants to play different games, taste test different products and learn about being healthy and fit. The race will be held at Dead President’s Restaurant, 618 N. Union St., in Wilmington. Participants will receive T-shirts and be entered into a raffle where they will have the opportunity to win gift cards, 4-H prizes and the grand prize of an iPod Touch. 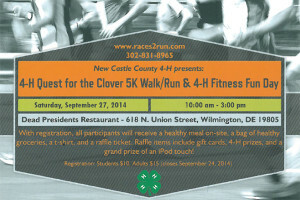 All proceeds will benefit the New Castle County 4-H program on both the county and club level. 4-H is a youth development organization serving children ages 5-19 that covers hundreds of project areas and strives to reach youth in three national mission mandates: healthy living, citizenship and science. Participants are encouraged to pre-register for the race. Registration ends Sept. 24 and the cost is $10 for youth, students and children and $15 for adults. Registration is available online at Races 2 Run. For more information, contact Mallory Vogl. For 4-H volunteer opportunities, contact the 4-H office at 302-831-8965. This story can also be viewed on UDaily. Anyone can be a scientist, science can be lots of fun and — to the surprise and delight of most of the children who participated in the 2014 University of Delaware Marvelous Microbes Camp — science can be easy. Those were the key messages that Emily Sklar, a master’s degree student in UD’s College of Education and Human Development, hoped to instill in the youngsters who participated in the camp, which was run in cooperation with 4-H through a grant from the National Science Foundation. Aimed at children ages 5-13, Marvelous Microbes took place in all three counties, with the New Castle County camp taking place the week of July 14 at Gauger-Cobbs Middle School and the southern Delaware camps taking place concurrently the week of July 21 at Mifflin Meadows in Kent County and the Hickory Hill Community Center in Sussex County. The camp served many at-risk children, who Sklar said can sometimes find themselves falling behind during the school year. “They really respond well to having us come in and dedicate our time to them,” said Sklar. “A lot of these kids are told they’re bad kids. They’re the ones acting up, they’re the ones not doing homework, they’re the ones failing tests, and having us take the time to come in and create something fun and educational for them has a huge impact.” Sklar noted that doing something as simple as offering up words of encouragement worked wonders for the students. “If we come over and say, ‘Wow, you’re a really good scientist’ or ‘You’re doing a great job on that experiment,’ and you see this light bulb turn on with them thinking, ‘Oh, maybe I am good at this. Maybe I’m not a bad kid, maybe science is something for me.’” Sklar served as the lead teacher for the camp and created the camp curriculum after being selected by Janine Sherrier, professor in the Department of Plant and Soil Sciences in UD’s College of Agriculture and Natural Resources. Learning process Sklar said the campers do everything ranging from making bread — to show how bread with yeast rises and bread without yeast doesn’t — to completing tasks as difficult as a Gram stain, a method of differentiating bacterial species, which she said is an Advanced Placement level high school experiment. With activities like bread making, Sklar and the teachers also got to teach the campers life skills. “They got to learn how to measure and also, in talking about microbes, they learned the importance of washing their hands and general kitchen safety. We’re teaching them a lot of other things, too, it’s not just science,” said Sklar. One of the main goals of the camp was to show that anybody, regardless of age, race or gender, has the ability to be a scientist. On their first day of camp, the students were asked to draw a picture of a scientist. Sklar said, “About 75 percent of them drew a white male, with crazy hair. Then, on the last day, we had them draw a picture of a scientist again and a lot of them drew themselves, which was fun. It was cool to see that progress.” Another teaching tool the camp incorporated this year was teaming with the ArtsBridge Program to help the students think outside the box when it comes to learning science. Sklar said the ArtsBridge teachers instructed the campers in dance movement, music vocabulary, how to read music, and tone and pitch in the context of a content area, in this case science. DBI imaging One of the highlights of the camp was when a group of campers traveled to UD’s Delaware Biotechnology Institute (DBI) where they got to see the room known as “The Cave,” a visualization studio with a giant screen that displays 3D images. The campers got to see images of the microbes that were discussed in camp sessions, and also of lungs as they took a virtual trip down the esophagus and through the bronchial tubes. Sklar said many physicians and researchers use The Cave for access to leading edge technology that can help them better understand what is going on in the human body. “It’s really cool and the kids really enjoyed that,” she said. And of course, using the tools is always fun. “They also got to use some of DBI’s high-powered microscopes and look at different images and touch some incredible machines,” said Sklar. As for her personal favorite part of the camp, Sklar said that it’s a natural blending of two of her favorite things: teaching and science. “One of the reasons I went into teaching science is my love for biology and my love for sharing knowledge with others, and I love seeing other people get excited about science, especially kids. Teaching them that it’s not all just sitting in a lab mixing chemicals and it’s fun, it can be easy — it can also be really, really hard — but it can be easy. 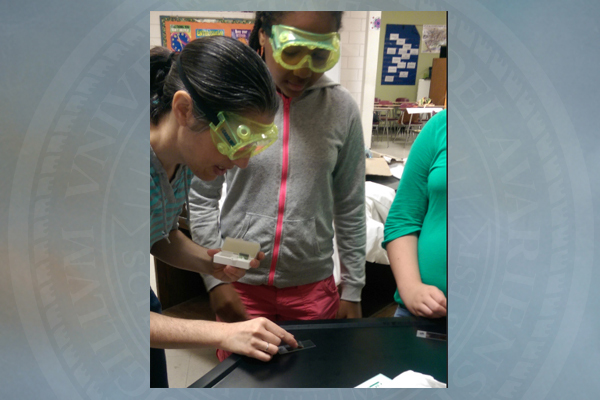 “And I’ll never forget one of the students looked at me and said, ‘Science in school is boring, but you guys make it so easy and fun.’” Funding Support for the camp was provided through National Science Foundation grant NSF-1127155, which was awarded to Sherrier. It is related to a larger NSF-funded science project on plant genomes and microbes. Article by Adam Thomas This article can also be viewed on UDaily. 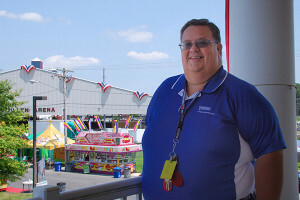 Ask Doug Crouse if Christmas in July is a real event and he’ll answer “yes.” It’s called the Delaware State Fair, an annual event at which he has worked for 25 years. Crouse wears many hats inside the 271 acres of the Harrington-based state fairground. As Kent County’s 4-H agent and 4-H building superintendent — and also serving year-round as the fairground’s treasurer and on the board — the days and weeks surrounding the 10-day “fair week” are full of planning and excitement equaled only by the winter holiday. If any event can get a human being frazzled, it would be the first day of fair week as questions are put to Crouse left and right. The Delaware 4-H building, located at the Centre Ice Rink, averages 10,000 4-H exhibits alone. Crouse is the go-to authority for where they are placed and how each is arranged for display. But Crouse, who hears his name called numerous times, answers each question and solves each mini-crisis with calm aplomb. “If I can survive the first day, the rest of the fair I am home free,” he said. Paula Woods, a Kent County 4-H volunteer, said of Crouse, “I go to Doug for everything. He can multi-task like no one I ever known. He is more than kind and he never loses his temper.” Crouse’s unflappability and calm manner come from years of experience and doing what he loves. He was nearly born into it. Born and raised in Felton, Delaware, Crouse grew up with 4-H. At the age of 10, he joined the Harrington Sunshine 4-H Club and was exposed to all that 4-H had to offer. 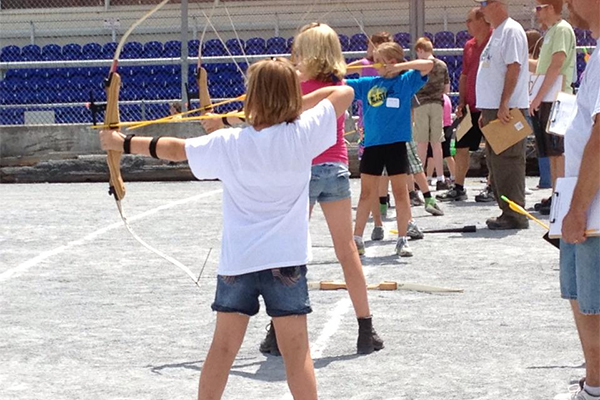 “I did everything in 4-H, except state 4-H camp,” Crouse said. His 4-H leader was Jane Everline, whose high expectations Crouse recalls fondly. “It was never put to us, ‘Will you do a public speech or demonstration?’ Rather I was asked, ‘What is your public speaking topic going to be?’ Participation in those events was expected,” said Crouse. After Crouse graduated from high school and the 4-H program, he earned an accounting degree from Delaware State University and began a 20-year career in banking. Crouse worked at several local banks as a teller, a branch manager, in loans and credit and eventually as president of his hometown Felton Bank. In 1982, Crouse married Karen Poore, and the first of their two daughters, Heather, arrived two years later. Heather joined 4-H at the age of 9, and her sister Jennifer followed. All became members of the same club to which their father had belonged. A 4-H career beckons Eventually, when the organizational leader of 4-H stepped down, Crouse was asked to assume the role, which he did along with his wife Karen. For Crouse, returning to 4-H felt right. Under their joint leadership, the club’s roster grew from eight members to well over 100. As a full time banker, Crouse never saw the additional responsibilities of running a 4-H club as a burden, rather he saw it as a respite. “4-H was my way of relieving stress,” Crouse said. “I love working with children.” In 2001, Crouse became a Kent County 4-H agent. Although he was president of the Felton Bank, Crouse was looking for something different in his life and talked about it with his family. The decision was a difficult one to make with salary an important factor. “Having money does not always lead to happiness and it is a decision I have never regretted,” said Crouse. In 2006, Crouse became Kent County Extension director, housed at the Paradee Center in Dover. Fair treasurer Crouse’s financial experience and reputation made him a natural to be tapped to help the fair’s treasurer. In 1982, while still working as a banker, Crouse was asked if he was interested in helping the fairground’s part-time treasurer. He agreed and served seven years as an assistant to the treasurer, helping with gate sales and admissions. In 1989, the treasurer retired and Crouse found himself voted in as a fair board member and treasurer. Serving on the 80-member fair board is a year-round task, and while fair board members tour other fairs to get new ideas to bring back to Delaware, Crouse said, “Nothing can compare to what we have here.” In his years as treasurer, Crouse has many interesting stories to tell, as he’s personally met almost every entertainer who has played at the Harrington venue. Crouse reviews the contracts that come in, working closely with the agents to see it all runs smoothly and learns of the usual show business requests, such as the type of stool an entertainer wants to sit on, or a particular brand of food or beverage an act may want. The most puzzling line item came when a country act stipulated in their contract that they did not want any farm animals visible during their stay at the fairgrounds. “I was surprised at that kind of request,” said Crouse. Article by Michele Walfred Photo by Jacquelyn Arpie This article can also be viewed on UDaily. 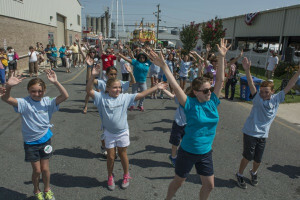 Surprising then entertaining visitors at the Delaware State Fair, a University of Delaware Cooperative Extension 4-H flash mob burst onto the scene Tuesday, July 22, to raise awareness about the Food Smart Families healthy eating program. The flash mob, featuring people of all ages, performed its dance routine to the song Veggie Believer by Carl Winter, a parody based on the Monkees’ 1966 hit I’m a Believer. The dance routine was created by Laura Sahd, a senior in UD’s College of Health Sciences who majors in dietetics and nutrition, minors in dance and is an Extension Scholar. She said that being able to combine her undergraduate interests while working with children was a great experience. “It’s been really exciting because I teach dance, as well. 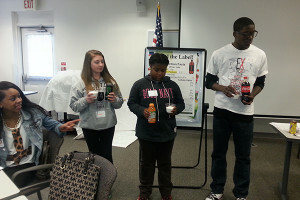 It’s really fun to apply that knowledge and apply my nutrition knowledge and work with kids,” said Sahd. While working as a dance instructor, Sahd has choreographed ballet and tap dance routines for 3-7 year olds but said she had never planned a routine this big before. She said it took about two weeks to plan the routine and that two practice sessions were held in Kent and New Castle counties, with the routine video recorded and emailed to those who were unable to attend the rehearsals. In addition to planning the dance routine, Sahd has also been spending the summer teaching the Food Smart Families curriculum to youth attending summer camps throughout the state. She said she enjoys the educational aspects that the Food Smart Families program provides to participants. “It’s great to get them started learning about healthy eating and how to make healthy choices, whether they’re choosing fast food or what they should drink,” said Sahd. “Food Smart Families is a way to start to get people thinking about what they’re choosing to eat, and to start good habits early in life.” Food Smart Families The Food Smart Families grant was awarded to the National 4-H Council by ConAgra Foods, and Delaware 4-H was one of five state programs selected to receive funds to undertake nutrition education. The nutrition education is delivered to children ages 8-12 in five two-hour lessons taught by one teenager and one adult. The goal is to reach 2,500 children in the state with 10 hours of nutrition, physical activity and “shopping savvy” education by Oct. 31. Michelle Rodgers, associate dean for Cooperative Extension in UD’s College of Agriculture and Natural Resources, explained, “One of the objectives of the Food Smart Families grant is to increase fruit and vegetable consumption, along with increasing physical activity and a number of other goals.” Rodgers said the flash mob “was really just a fun way for the youth to be involved in the program, to get engaged with the concept, to showcase what they’re learning and to help them think about it in a different way. We’re pretty excited about the flash mob and about what we’ll able to do with this grant in terms of outreach.” Kathleen Splane, extension agent and state program leader for family and consumer sciences, said that in addition to offering the curriculum at summer camps, “We’re doing a lot of community events at different community centers where we’ve done the education. That is designed to bring the parents and the families in to learn more about the program.” Sue Snider, nutrition and food safety specialist with Cooperative Extension, adapted curriculum from Cornell Cooperative Extension to create Delaware’s 10-hour program. The five sessions taught are focused on getting participants to drink low fat milk and water instead of sweetened drinks, to eat more fruits and vegetables, to eat more whole grains, and to eat fewer high fat and high sugar foods. Sessions also teach the importance of eating a healthy breakfast. Every week, the Food Smart Families curriculum is taught at about a dozen sites throughout the state and judging by the pre- and post-tests given by the program leaders, the message has really resonated with the Delaware youth. “We’ve had some really positive feedback from the kids. Kids are saying, ‘I’ll never drink soda again.’ We’ve had kids that have been in camps and they’re reading the labels of what’s in their lunch,” said Splane. “And parents are responding like ‘How are you getting my kid to eat zucchini? They never ate zucchini before.’ It’s due in part to the fact that every lesson has food preparation as a component, so the kids get to sample a healthy recipe that’s associated with the lesson that day.” Article by Adam Thomas Photos by Doug Baker This article can also be viewed on UDaily. 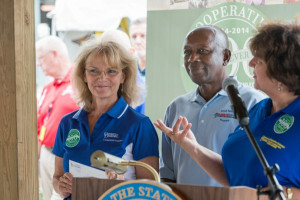 University of Delaware Cooperative Extension will once again have a strong presence at this year’s Delaware State Fair, which runs Thursday, July 17, through Saturday, July 26, at the fairgrounds in Harrington, Delaware. 4-H youth, in particular, have a strong stake in the Delaware State Fair as it serves as the culmination of planning that begins at the start of the 4-H year the previous September. As they move through the year, 4-H youth reserve the best of their work to display at the fair, with exhibits that span several diverse project areas including canning, entomology, beekeeping, clothing and textiles, horticulture, crops, food products, woodworking, computer graphics and photography, to name just a few. Extension staff, Master Food Educators, Master Gardeners and 4-H alumni serve as exhibit judges. In 2013, 4-H checked-in 10,362 exhibits. 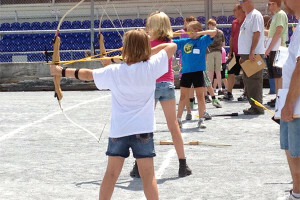 The 4-H general demonstrations, also known as illustrated talks, will take place from 10 a.m.-noon, Monday, July 21. In addition, there will be 4-H floats on display during fair’s nightly parades. The Delaware State Fair is the capstone event for 4-H contest winners at the county level, who will vie for overall state honors in Harrington. There will be competition in livestock, poultry, horticulture, vegetable, clothing and textiles, and photography. Other featured contests include tractor driving, photography, archery, Avian Bowl, Consumer Bowl, the 4-H Horse Show and a talent show. The awards celebration for these contests will be held on Saturday, July 26, from 5-7 p.m. In addition to the 4-H presence, Cooperative Extension will be represented by members of the Master Gardeners, who will answer gardening questions at their gazebo across from the plaza. At the Delaware Department of Agriculture (DDA) Commodities Building, the Cooperative Extension exhibit will feature an online Ask an Expert station, which debuted at the state fair last year. At the station, members of the public are invited to query on topics that include lawn and garden, food safety, consumer sciences and questions about 4-H. Live Extension experts will also be on hand to answer questions. 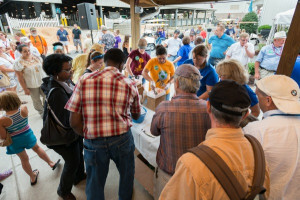 Directly across from the Extension exhibit, DDA’s demonstration kitchen will serve as a stage for a variety of interesting and delicious “how to” presentations, many taught by UD Extension staff members. In celebration of Cooperative Extension’s 100th anniversary, there will be chances to win one of four gift baskets from each of Extension’s program areas — 4-H, lawn and garden, agriculture and natural resources, and family consumer sciences — with the drawing taking place on Saturday, July 26, at noon. The Cooperative Extension centennial celebration ceremony will take place from 2:30 p.m.-4 p.m., Thursday, July 24, in the Grove Picnic Area. The public is invited to hear brief remarks by Gov. Jack Markell and others, and enjoy cake and the unveiling of the Centennial ice cream flavor created by the University’s UDairy Creamery especially for the occasion. Article by Adam Thomas and Michele Walfred This article can also be viewed on UDaily. 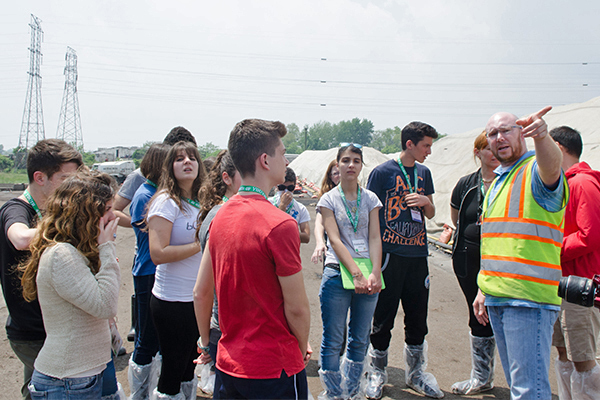 The University of Delaware Cooperative Extension 4-H Program recently hosted 14 students from Sicily, the largest of the Italian islands, as part of the 2014 Youth Ambassadors Program. The program is funded by the U.S. Department of State through its Bureau of Educational and Cultural Affairs (ECA). The participants spent time in the United States from May 17 through June 7 and did everything from exploring Washington, D.C., to spending a night in New York’s American Museum of Natural History. They also learned how to solve problems facing their communities, important information that they can take with them as they return home. “They’ve had a pretty broad experience with the idea that they go back to Sicily and maybe do some projects in their community that engage people,” said Mark Manno, Delaware 4-H program leader. “We’ve been trying to teach them how to identify who the stakeholders are in their community and then how to proceed with a project, looking at what steps they need to take so that it’s successful. I think learning those skills will really help them in the end because you could have a great idea for a project but if you don’t know how to implement it, it won’t get off the ground.” Many of the students identified pollution as a major problem in their community and so they spent time at the Peninsula Composting Group facility learning about commercial composting. They also took an ecological kayak tour at Sedge Island in New Jersey and helped plant beach grass to replenish the dunes. In addition, the students learned about working in groups, doing team-building exercises to learn about each other’s personalities and how they meshed when trying to solve a problem. “They’ve gone through what we call the True Colors personality IQ so they all understand their particular styles,” said Manno. “We always do that with kids and it’s really an exercise in diversity. They learn ‘why is this person this way and why am I that way,’ and it helps them understand that some people are very organized and some are just completely different. So they’ve done a lot of skill building and team building exercises.” Chiara Maggiore, one of the students participating in the program, said that the program “is really teaching us something about ourselves in particular; about our capacities and how we can do something better for our community. I like the fact that we are having so much fun. We are enjoying the trip and we are experiencing things for the first time. At the same time, we came from different parts of the same region and we have such different personalities but we’ve come together and created a great group.” Gaetano Pardo, another student on the trip, said that he had visited Australia before and was expecting America to be similar to that country. “I was expecting it to be like Australia but it’s not,” said Pardo. “There are a lot of trees and the houses are very different.” Extending across states The students spent a large portion of their time in the United States in New Jersey, staying with 4-H host families in the state and being led by Rutgers University Cooperative Extension. Manno pointed out that Alayne Torretta, a New Jersey 4-H agent, was great to work with and that this program — as well as the last program that had students from Colombia and Ecuador — shows the possibilities of Extension partnerships among different states. “Last fall Delaware 4-H teamed with Maryland’s Cecil County 4-H. This is a great example of cross-state partnerships in Extension. When I first got this grant, I knew we couldn’t do two cycles a year, so I put out a call to my colleagues in the northeast region and I got a lot of interest from that. And I’ve known Alayne Toretta a long time and it’s worked out very well so far,” said Manno. Manno added that Delaware 4-H is waiting to hear from the State Department about round two of the program. “Teens from almost anywhere in the world may be coming to Delaware and Maryland soon,” he said. “Wherever they come from, they’re guaranteed a great experience in learning about democracy and problem solving.” Article by Adam Thomas Photos by Danielle Quigley This article can also be viewed on UDaily. During its inaugural year, Delaware’s 4-H Palindrome Robotics Club had a strong showing, competing in a regional championship and finishing with a top 40 ranking in the Mid-Atlantic. Club members competed in three competitions, making it all the way to the Mid-Atlantic For Inspiration and Recognition of Science and Technology (FIRST) Region Championships at Lehigh University in Bethlehem, Pennsylvania. 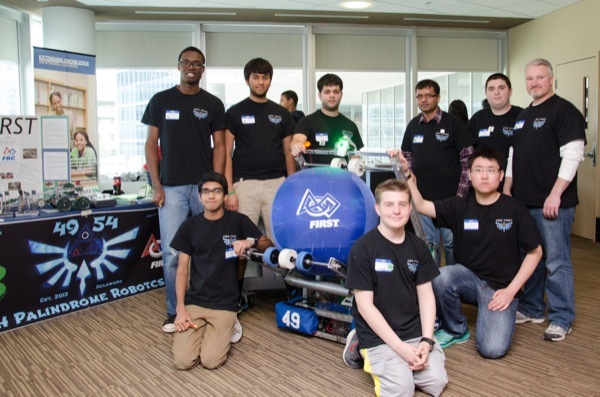 Palindrome Robotics finished the season ranked 36th out of 110 teams in the region, which is no small feat for a team that started in August 2013. The club made it to the regional championship by competing in two district events, finishing as a semifinalist at the first district event and as a quarterfinalist in the second event. At the competitions, the club competed with its robot, named Aibohphobia — meaning the fear of palindrome — in a group competition that saw alliances of three teams working together with their robots to compete in a game created by FIRST called “Aerial Assist.” The game was played by two competing “alliances” of three robots, each of which had to work together to score as many goals as possible in a two minute and 30 second time period. One goal was suspended seven feet high, with two lower goals located on each corner of the field. Teams were awarded 10 points for the high goals and one point for the low goals. Robots were allowed to play the role of goalies in order to keep the balls out of their goals. There was also a five-foot truss in the middle of the field that teams scored points for getting the ball over, and teams were awarded bonuses if their robots assisted their alliance members in the scoring of goals and moving the ball together through the field’s three zones. The balls that the alliances had to move were exercise balls approximately two feet in diameter, and one human player stood on the side to load the balls onto their robots. The first 10 seconds of each match was an “autonomous period” in which the robots operated independently of their drivers and each robot was allowed to begin with a ball and have a chance to score a goal. For the rest of the match, drivers remotely controlled the robots from behind a protective wall, known as an “alliance station.” Santesh Shah, the mentor for the club, explained that it took the club six weeks to design, build and program the robot. Shah said that his favorite part of being involved with the program is that he can “teach kids things in the science, technology, engineering and mathematics (STEM) fields and then see them build a robot that can accomplish the task it was built for.” Club’s formation The 4-H Palindrome Robotics Club was formed when a group of young people approached Mark Manno, Delaware 4-H program leader, and Mallory Vogl, Cooperative Extension agent, about partnering with 4-H so they could compete in the FIRST Robotics Competition (FRC), which is a high school age competition that requires participants to be associated with a non-profit organization. “A few of them had participated in another group before but they were trying to start their own group and it just seemed from the beginning like a wonderful partnership,” said Vogl. “We obviously are a non-profit organization and so that worked out for them. For us, 4-H has three national mission mandates, one of them being STEM, and science is our biggest push right now, so any time we have the opportunity to do some different science programs, we are all about that. It just seemed like a match made in heaven.” The 4-H club has 18 members, and 16 of them attended competitions. The club usually meets once or twice a week, either Tuesday or Thursday, with meeting reminders sent out through email and posted on the club’s website. Shah said that the club is now actively participating in community events and recruiting for its next season in 2015. Article by Adam Thomas Photos by Danielle Quigley This article can also be viewed on UDaily. 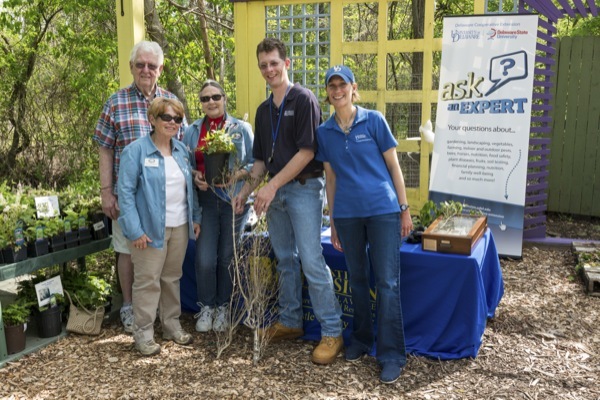 University of Delaware Cooperative Extension agents, specialists and Master Gardeners headed to Gateway Garden Center in Hockessin, Delaware, on Saturday, May 10, to give a brief presentation on successful gardening methods. The team was on hand to discuss good plant health and identification of both insect pests and beneficial insects in local landscapes, and to answer any questions that the customers had when it came to their home gardens. They were also there to inform the public about the many free and beneficial services Cooperative Extension offers to the community. 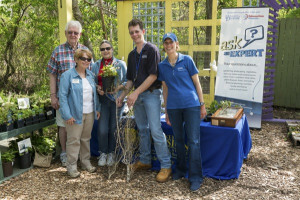 Brian Kunkel, an extension specialist, and Carrie Murphy, extension agent, attended the event along with Jane Adams, Betsy Rosenberger and Bob Deming, all Cooperative Extension Master Gardeners. Murphy said the program was successful as it provided “another great opportunity to take Cooperative Extension and Integrated Pest Management (IPM) information directly to home gardeners, in their community garden center.” Kunkel said he answered mostly insect- and pest-related questions, as he brought with him a variety of insects and examples of diseased plants. “We had a table where I brought pinned insect specimens, various wasps and bees, because that’s often a common question I get from home owners — what can I do with my bees? So I was able to say, ‘Look, all these bees that you’re seeing here are not pests. However, they can be a nuisance and in some instances you may need to do something, it just depends on your own physiology and what your own tolerance levels are,’” said Kunkel. Kunkel said that while it was important to educate those who were at the garden center about insects and plant disease, there also was a larger goal of informing them about the many Cooperative Extension services that are available. “We provide a service at no cost to home owners and I think a lot of the industry is fully aware that we are there, and they use us when they have the need, but homeowners aren’t always aware that there is actually help out there that is reliable and that they don’t have to pay for,” said Kunkel. “Our goal has been to try and increase Cooperative Extension awareness, and that it’s not going to cost anything and that we’re willing to help you out.” As far as the services Cooperative Extension offers homeowners, Kunkel mentioned insect and plant disease diagnoses, plant identification, soil sampling — to let homeowners know what type of soil they have and what plants will perform the best in their gardens — and household insect identification. 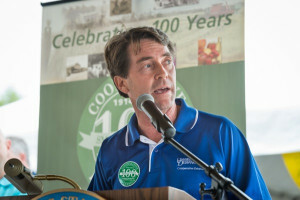 Murphy added that the team provided information about the Master Gardener program, including the garden line (302-831-8862), home gardener workshops, the home horticulture advice program, and demonstration gardens, and information on “sustainable landscapes and implementing an IPM plan in your landscape to help sustain its health.” An open house, integrated pest management (IPM) walk and talk will be held on Thursday, June 19, from 6-8 p.m. at the New Castle County Cooperative Extension teaching and demonstration garden. Kunkel, Murphy and the Master Gardeners will take participants on a plant, pest and beneficial insect walk. The event is free and open to the public. For more information, visit the Cooperative Extension Lawn and Garden website. Article by Adam Thomas Photos by Evan Krape This article can also be viewed on UDaily. Delaware Cooperative Extension has announced its 2014 schedule of Weed Science School training to be held from 8:30 a.m.-3:30 p.m., Wednesday, March 12, at the Kent County Extension Office, 69 Transportation Circle Dover, Del.19901, and from 8:30 a.m.-3:30 p.m., Friday, March 14, at the University of Delaware Research and Education Center Annex (old office building) 16686 County Seat Hwy., Georgetown, Del. 19947. The weed management training will focus on weeds and issues with agronomic crops and commercial vegetables. 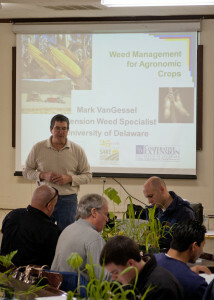 The training will be conducted by Mark VanGessel, UD Cooperative Extension weed specialist and his research and Extension team. The objective of Weed Science School is to train agriculture industry professionals and those who work on weeds frequently. Topics will include weed management concepts and principles. Lunch is provided and resources will be made available. There is no fee for the training. Participants are asked to pre-register by March 7 with Karen Adams at (302) 856-2585 x 540. 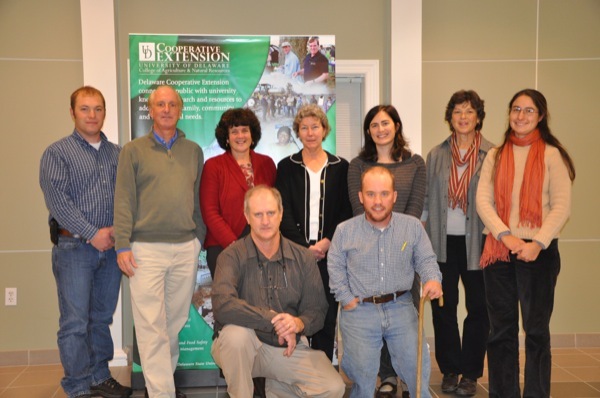 Pictured are members of the lima bean research project (from left, front row) Gordon Johnson and Andy Kness, a master’s degree student, and (back row) Phillip Sylvester, Kent County Extension Agent and prospective graduate student on the project; Tom Evans, professor of plant pathology; Joanne Whalen, exentension specialist in entomology; Nancy Gregory, plant disease diagnostician; Nicole Donofrio, associate professor of molecular plant pathology; Kate Everts, professor of plant pathology, University of Maryland; and Emmalea Ernest, extension associate, vegetable crops.